Topics: Neck Pain, Fractures, Degenerative Disc Disease, Herniated Disc, Osteoporosis, and Ankylosing Spondylitis. Age: It went live on March 7th 2002, making it over 16 years, 0 months old. allaboutbackpain.com Things You Can Do at Home: ice and heat, relaxation, rest ..
187 users visit the site each day, each viewing 1.40 pages. It is hosted by Peer 1 Dedicated Hosting (Georgia, Atlanta,) using Microsoft-IIS/7 web server. The programming language environment is ASP.NET. 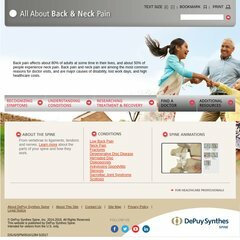 ns1.depuyspine.com, and ns.depuyspine.com are its DNS Nameservers. PING (66.132.128.162) 56(84) bytes of data. The server is slower than 84% of measured websites, at 907 milliseconds. Also a time of 63.1 ms, is recorded in a ping test.